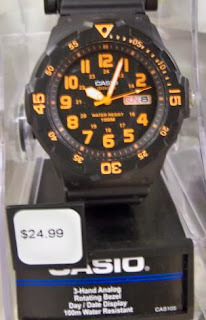 The Watch Dude: Casio MRW200H Diver-style Watches - Adventure on the Cheap! Casio MRW200H Diver-style Watches - Adventure on the Cheap! 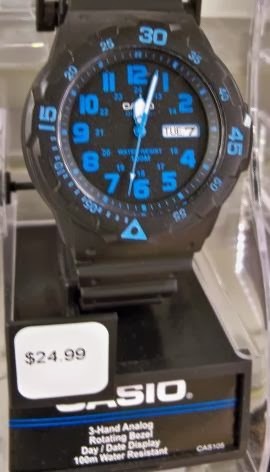 There are some watches that I see every time I go to the store. They catch my eye, hold my attention, and then I put them back. These watches intrigue me, but are just too similar to some of the watches that I already have in my collection. For example, these Casio MRW200H Dive Watches are attractive and affordable. You can always find them at Walmart, Target, or Kmart. Amazon has them even cheaper! These utilitarian dive watches have rotating bezels and are waterproof to 100 meters. They also have readable dials with large numbers, day/date windows, and a mineral crystal. It should be noted that the bezel is not unidirectional and doesn't give you a click with each turn. But, at less than $25, they are the kind of watch that you won't be afraid to abuse. 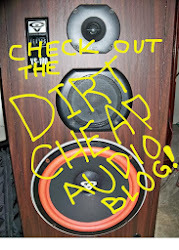 They look good and they offer adventure on the cheap! I think I would buy one of these watches in a flash. But, my trusty Timex is still taking a licking and it still keeps on ticking. One day, I'll surely succumb to the lure of an inexpensive bang around Casio watch that has adventure written all over it! Unreadable Monochrome Watches Must Go!